Wow, I go away for a week and everything in the Zune world turns upside down it feels like. I just got back from Indianapolis last night (and I’m still trying to recover I might add) and I find that Zune Masters is shut down and the URGE partnership has evaporated. I’m not surprised ZM went away but I never suspected URGE was going to blow up on Microsoft. I certainly hope they knew it. With all of the somewhat sad news here, I was hoping I could find something to brighten things up. Anything would do really. 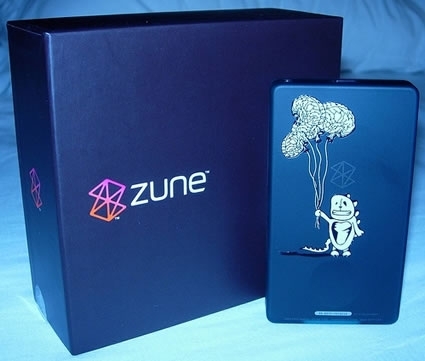 Sadly all I could find were stale rumors about Zune 2.0 and the 1.5 firmware update. That’s when I found this on Zune-Online.com. And if that goofy looking dinosaur thing can look that happy on the back of a Zune holding some balloons that look like brains, well, then things must not be too bad. Right? Man, noone has happy thoughts?